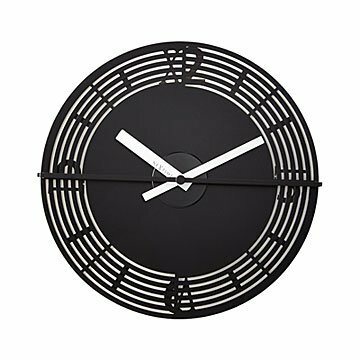 This kinetic clock features Roman numerals that slowly transform into numbers and back again. The Romans gave us the Colosseum, the Pantheon, and funny numbers like "XII." Time travel through a little history with this kinetic clock featuring Roman numerals that slowly transform into Arabic numbers and back again. The effect is made by the magic of moiré, where intersecting patterns simulate motion. To create a kinegram—the illusion of movement in a still, graphic image—the moiré effect is manipulated in a pre-motion-picture form of animation. Here, a perforated overlay turns independently of the clock mechanism, making a mesmerizing kinegram of shifting numbers. Uses one AA battery (not included). Designed by Zoltan Kecskemeti in Budapest. Made in China. By day, Hungarian Zoltan Kecskemeti is a 3D artist for video games and animated movies. By night (or whenever his spare time happens to be), he focuses on his own ideas and visualizes designs like the kinegram clock. It started with an idea, then he created a prototype and uploaded a video to YouTube. A clock manufacturer saw the video, and they have been working together ever since.